Where in the Wild? 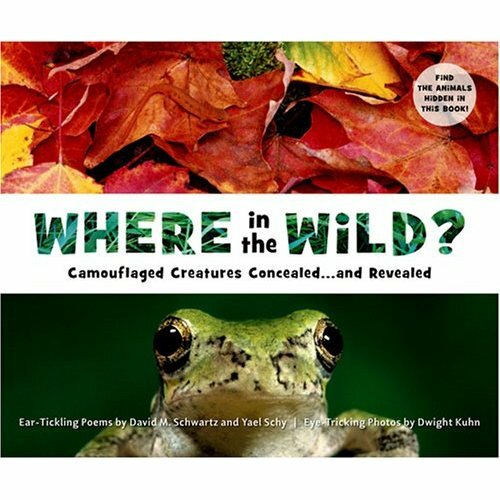 Camouflaged Creatures Concealed and Revealed, by David Schwartz and Yael Schy, with illustrations by Dwight Kuhn. Tricycle Press, 2007. The title and subtitle of this book, replete with an ellipsis pause, had me expecting an exposé of deception in the natural world. I wasn't disappointed. "Camouflage," from a French word meaning "to disguise," seems to have entered common usage from military vocabulary in the early 20th century, but even then, military applications alluded to the many animals in nature that were able to avoid detection by blending into their surroundings. The authors ask readers to look carefully at a series of 11 full-page color photographs and find in them the animals, or their eggs in one instance, camouflaged from would-be predators or prey. Ten of the photographs have poems on a facing page offering rhyming hints as to where to look and what to look for. Read the poems out loud for their full descriptive effect, but cleverly, some of the poems also have the printed lines arranged as visual hints: "Motionless" is printed in four "double-jointed" lines representing the four pairs of the motionless spider's legs, and the lines of "Serpentine" undulate across the page. At the bottom of each picture is the notation "lift to find me." Each folio unfolds to vividly reveal the previously camouflaged creature against a faded-out background. Each animal revealed has an accompanying page of life history information, with additional lore on its use of color and behavior in avoiding predation or in assisting in capturing prey. However, suggestions for further reading are lacking. Although the authors present camouflage "experts," from coyotes and deer fawns to green snakes, tree frogs, and salamanders, the masters of deception are the insects, here represented by ladybug beetles and moths, the latter often camouflaged in developmental stages and in the adult. In spite of the many nature documentaries on public and cable television and the seemingly endless proliferation of nature and animal sites on the Web, these authors and their photographer have put together interactive hard copy that should captivate today's youngsters. The only problem with the book is that it ends abruptly. I turned the last page expecting more! David Schwartz is the author of fifty children's books that make math and science come alive, including How Much is a Million?, G is for Googol, Q is for Quark, and If You Hopped Like a Frog. David is a popular speaker at schools in the U.S. and abroad. Learn more about him at www.davidschwartz.com. Yael Schy is a consultant, trainer, facilitator, and coach, who uses improvisational theater and dance to encourage leadership, teambuilding, and creative thinking in the workplace. She is co-author of a business training book, Teamwork Tools, and she also loves to write poems and songs. David and Yael live in Oakland, California, with their two well-camouflaged cats, Sushi and Sashimi. Dwight Kuhn's beautiful composed nature photographs have been featured in 125 children's books. His work has been recognized by the Children's Book Council, the Scientific American, and the John Burroughs Association. He lives with his wife and two dogs in Dexter, Maine.